Pasquale Terriaca first appears at Painesville, Lake County, Ohio, in 1922. When Pasquale immigrated to the United States Painesville, Ohio, was his destination. In America, Pasquale Terriaca was known Pasquale Terriaco. Pasquale Terriaca, son of Pasquale Terriaca and Caterina Fraraccio, was born on October 4, 1900, at Frosolone, Isernia Province, Molise, Italy. Pasquale married Teresa Cicerelli about 1927. He was widowed by the death of his wife Teresa Cicerelli on October 22, 1955, at Painesville, Ohio. After the death of his first wife, Pasquale married second, Adelina Pricolo. Pasquale Terriaca was widowed by the death of his wife, Adelina Pricolo, on 17 January 1988, at Mentor, Lake County, Ohio. 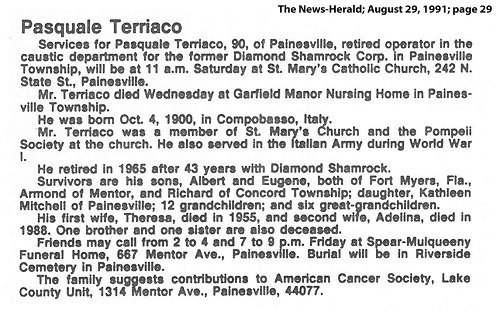 Pasquale Terriaca died on August 28, 1991, at Painesville, Ohio. His body was interred at Riverside Cemetery, Painesville, Ohio. Pasquale, age 22, first immigrated to the United States on November 8, 1922. He was traveling to Painesville, Ohio, to join his uncle, Donato Scacciavillani. Pasquale entered the United States at the Port of New York City aboard the ship SS Colombo. His name was listed as Pasquale Terziano on the passenger ship manifest. Mr. Terriaca became a citizen of the United States in 1928. He resided at 82 Sanford Street, Painesville, Lake County, Ohio, when he was naturalized. 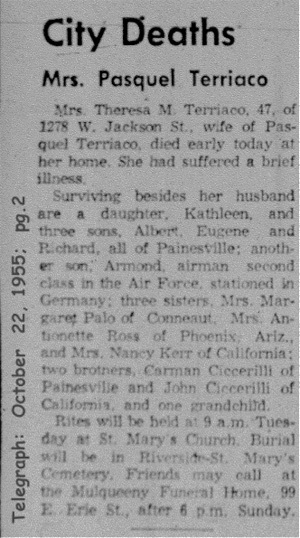 Pasquale Terriaca was enumerated for the 1940 Census of the United States, on April 13, 1940, living at Painesville, Lake County, Ohio, as a head of household. Pasquale was enumerated as Pasty Terriaco. Pasquale Terriaca, age 49, re-entered the United States on September 27, 1950, travelling to 1278 Jackson Street, Painesville, Lake County, Ohio. He re-entered the United States at the Port of New York City aboard the ship SS Ile de France. Pasquale’s name on the passenger ship manifest was listed as Pasquale Terriaco. Pasquale Terriaca was second cousin, one removed, of Painesville Italian Domenico Terriaca. 3. Anna Terriaco was born on July 26, 1930, at Painesville, Lake County, Ohio. Anna Terriaco died on January 17, 1933, at 1233 Elm Street, Painesville, Ohio. Anna fell into a tub of hot water and was scalded to death. Her body was interred at Saint Mary Cemetery, Painesville Township, Lake County, Ohio.